Soul survivor reunites with the label that launched his career and the result is captivating. Say what you want about the last half century of soul music, but you'd be hard pressed to find a more valuable label to the genre than Stax Records. We all know the timeless hits from Otis Redding, Sam and Dave and a plethora of other iconic figures. And by now, we should understand the impact its roster had as a whole on the trajectory of where this music has traveled through the years. But how often has anyone taken time to consider the imprint's modern day influence? Remember in 2015, when Nathaniel Rateliff & the Night Sweats put out one of the most surprisingly addicting soul sets of the year? That came out on Stax. How about Ben Harper and Charlie Musselwhite's 2013 blues romp, Get Up! that took home the Grammy in 2014 for Best Blues Album? That was released by Stax, too. Angie Stone has credits to the label. Lalah Hathaway. The list goes on and on. Yet in 2016, perhaps one of the label's best contemporary collections comes from a face best associated with its past: William Bell. This Is Where I Live marks the singer's return to the label that helped launch his career, and better yet, it's also a set that features new tunes. At 76, Bell could be forgiven if he decided to take the easy road like the majority of his contemporaries, releasing a record of classic covers or obscure, decades-old favorites. Instead, it turns out that he, along with John Leventhal, have crafted one of the year's best authentic-sounding, homage-paying, ostensibly new Southern Soul albums. Actually, of the 12 tracks, only two aren't the headliner's, and only one comes from an artist not associated at all with the project. That artist? Jesse Winchester. Bell's take on the late singer's "All Your Stories" is beautiful and tender, resisting the temptation to funk it up and staying true to the delicacies that made the original version -- as well as its creator -- as memorable as they were. The other song here without a William Bell byline actually comes from the record's producer, Levanthal, along with his wife, Rosanne Cash. "Walking On a Tightrope" is a lovely ballad that sways gorgeously before being punctuated by an organ solo that fills the bridge. You can practically smell the perfume from a 1967 high school prom that smothers the track without apology. 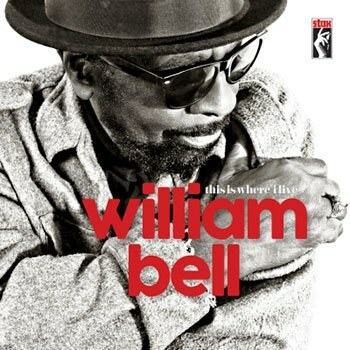 But the thing about William Bell is that he's always been just fine on his own. "You Don't Miss Your Water" was one of Stax's earliest hits, and lest we forget that it was Bell who, along with Booker T. Jones, wrote one of the most lasting blues songs from that era, "Born Under a Bad Sign", which went on to live in infamy after Albert King got his hands on it. The Memphis native revisits that classic here, giving it an understated backbone that slithers more than it shuffles. Plus, as he recites the iconic refrain, "If it wasn't for bad luck, I wouldn't have no luck at all," he reminds you of how painfully pretty his voice has always been. Never more is that evident here than it is on lead track "The Three of Me". The set's most memorable moment is also its most introspective, Bell wondering about his past while dreaming about three of him -- the man he was, the man he is, and the man he wants to be. It's a clever twist on an old reflective lyrical trick, but man, does it work. His voice is almost apprehensive, somewhat weathered yet stern, proclamatory yet humble. Add in a set of Southern horns behind him and this is a song that resonates just as well in 2016 as it would have in 1966. Another gem immediately follows that in "The House Always Wins". Set against a smooth ballad waltz, the singer aches as he explains, "Once I loved a woman / Once we shared a name / But the tides pulled us under / And now we can't get up again." It's there when the brass section fades in to help lift the chorus above any impending disastrous wave. Bell then uses that gambling metaphor to perfection, reminding all listeners that despite winning streaks, the weight of life is often too much to truly feel the glory of any perceived victory. And after 76 years, this sounds like a guy who you damn well better believe. It might also be wise to listen when he talks about the end of a long night, playfully declaring how when you're tired, "people want to go home" over a jaunty pop rhythm that ends the record. You might also want to hear him out on the set's title track, which pays respect to the town that made him by way of a soul-funk organ that ought to make one of his former co-writers proud. And if you somehow still refuse to pay attention, "I Will Take Care of You" will change all of that nonsense in a hurry. Written as a tribute to a sick friend, the song will break your heart. Yeah, there are actual instruments helping him through, but the only real piece of equipment on which you need to hone in is Bell's voice, which amounts to the most captivating element of the entire production. There's hurt. There's longing. There's regret. There's love. There's soul. Those are also the things that make This Is Where I Live an imperative listen for anyone claiming to be a fan of rhythm and blues, both old and new. With a voice as aching as this, William Bell continues to stand out as a Soul Survivor almost 80 years into a life that has seen The House win more times than he might hope. Luckily for us, though, this is a guy who can't stop gambling. And for that, the genre as a whole -- and especially Stax Records -- should be thankful.